The service user is responsible for the reconciliation of customer and payment details. To help with this task a number of reports are generated by Bacs for each Service User. These reports generally work by exception e.g. they inform you of something that has changed. They can be accessed via the payment services website; via Bacstel-IP software or by your bureau on your behalf. Direct Credit reports that you will need to action include the ARUCS and AWACS reports. The Automated Return of Unapplied Credit Service Report. If the correct account cannot be identified or the payment of the Direct Credit cannot be applied for any reason, the funds will be returned by the Receiving Bank to the remitting organisation’s bank account no later than Day 5 of the Bacs Processing Cycle (Day 1 being Input Day). A report, advising that the payment has not been applied and providing reasons why, will be made available to the Service User to download via the payment services website or via their Bacstel-IP software package. The report will include the Beneficiary Reference included in the original payment. Recipients of ARUCS advices must action them within 3 working days of the date the advice is available. It is strongly recommended that the changes are applied immediately to avoid the risk of misdirected payments. Service users should advise the Beneficiary of the failure, and obtain correct details where appropriate. Beneficiary has closed their account for an unknown reason. Remitter has requested payment is not applied. The Advice of Wrong Account for Credits Service Report. Where the Beneficiary’s sort code and /or account number has not been correctly detailed on the Bacs Direct Credit payment record, the Receiving Bank may apply the payment and provide advice of the correct details to the Service User via an AWACS Report. 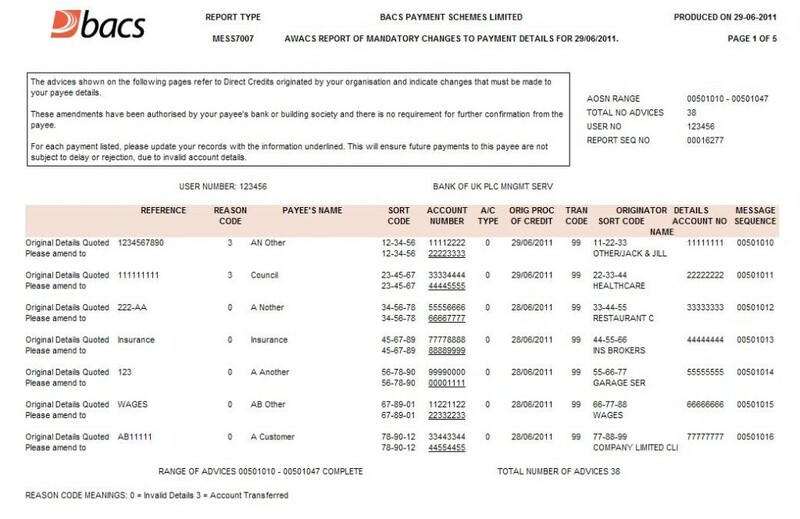 The Remitter of Bacs Direct Credits is required to action these. Receipt of an AWACS advice is authority to the Service User to amend their data file and no other communication with the Beneficiary is required. Correct account details supplied to the Service User. Service User must apply change to data file. New account details supplied to the Service User Service User must apply change to data file. These changes must be applied to the data file no later than 3 working days from the date the advice is available. It is strongly recommended that the changes are applied immediately to avoid the risk of misdirected payments. Note: AWACS advices may show as being returned from a different sorting code to that which was quoted in the original payment record. This could be due to the payment being redirected by Bacs under AWACS service B or C.